The president’s office has rescheduled a third meeting in ongoing talks with the main opposition Maldivian Democratic Party (MDP) for Sunday, July 12. A meeting was set for Wednesday night, but cancelled at the last minute as some government representatives are out of the country. The government is due to propose mechanisms to release jailed opposition politicians and withdraw charges against some 1,400 opposition supporters. The long-awaited talks has raised hope of an end to a six-month long crisis triggered by the arrest and imprisonment of former president Mohamed Nasheed. The opposition leader was transferred to house arrest in late June. President Abdulla Yameen had proposed three teams of ministers to sit separately with the three allied opposition parties. The Jumhooree Party and the government held two meetings in June, but there had been no progress with the MDP or the Adhaalath Party as the government vetoed some of the proposed representatives. The MDP had proposed Nasheed and Adhaalath had proposed Sheikh Imran Abdulla, who is in police custody awaiting trial on a terrorism charge. 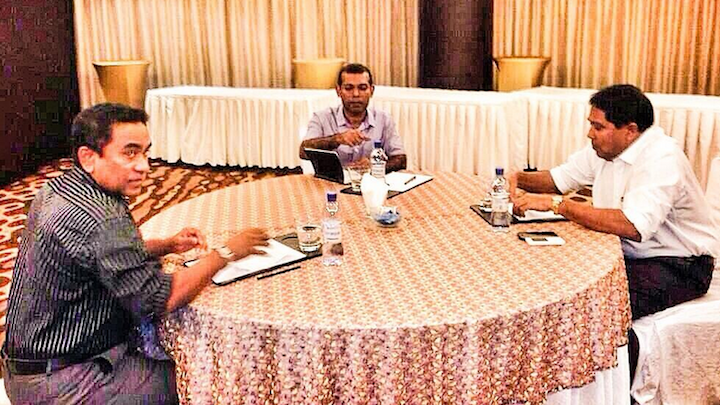 With Nasheed’s transfer to house arrest, the MDP agreed to begin talks without the opposition leader. Talks are yet to begin with the Adhaalath. At a second meeting on Sunday, the government conceded to an MDP demand to commence all-party talks at a later stage when constitutional and legal reform are on the table. The MDP and the government are currently discussing the opposition’s six demands for political reconciliation. In addition to freeing jailed politicians and withdrawing charges against supporters, the party has also called for an independent inquiry into the disappearance of Minivan News journalist Ahmed Rilwan and the brutal murder of MP Afrasheem Ali. The MDP has also proposed that talks conclude within a two-week period. President Abdulla Yameen has pledged today to begin talks with the opposition Jumhooree Party (JP) whose senior officials appear to be in self-imposed exile. JP leader and tourism tycoon Gasim Ibrahim has been in Bangkok since late April, ostensibly to repair a boat. Local media report the criminal court has issued an arrest warrant for Gasim on a charge of financing a historic anti-government protest on May 1. The JP’s deputy leader Ameen Ibrahim and council member Sobah Rasheed are accused of inciting violence at the May Day protest, and have been charged with terrorism. If convicted, they face between 10 and 15 years in jail. Both Ameen and Sobah are out of the country. In a video message, Sobah said he is seeking political asylum. Talks will begin within the next two days, he said. The JP was not responding to calls at the time of going to press. The president called for separate talks with the JP, the main opposition Maldivian Democratic Party (MDP) and the religious conservative Adhaalath Party. The JP immediately agreed to sit down with the government without conditions. In addition to Ameen, the party has proposed MPs Ilham Ahmed, Abdulla Riyaz, and Hussain Mohamed to represent it at the talks. President Yameen has ruled out negotiations over Nasheed’s release. His agenda focuses on political reconciliation, strengthening the judiciary and political party participation in socio-economic development. The MDP has proposed Nasheed, chairperson Ali Waheed and MP Ibrahim Mohamed Solih as representatives. The Adhaalath Party proposed its president Sheikh Imran Abdulla, who is currently in police custody. He is also charged with terrorism over the May Day protest. The government has rejected Nasheed and Imran as representatives. “Adhaalath Party and MDP have not shown me a way of proceeding with this. They have stated they will not talk with the government without certain people. I don’t believe that a party which considers the interest of the whole party or the interest of the public would put forward a person in detention or serving a sentence to discussions with the government,” the president said today. The government had previously rejected the opposition’s calls for talks because their terms were unacceptable, he continued. The government had decided to call for talks in the interest of the public and because the international community “believes there are many issues that needs discussions and need to be solved,” he said. “Now is the time to build the country. We have lost five years. That’s the truth. This is the chance to start projects to develop all areas of the country. This is the time to provide the youth with employment. My appeal to the people of Maldives is to grab this chance,” he said. 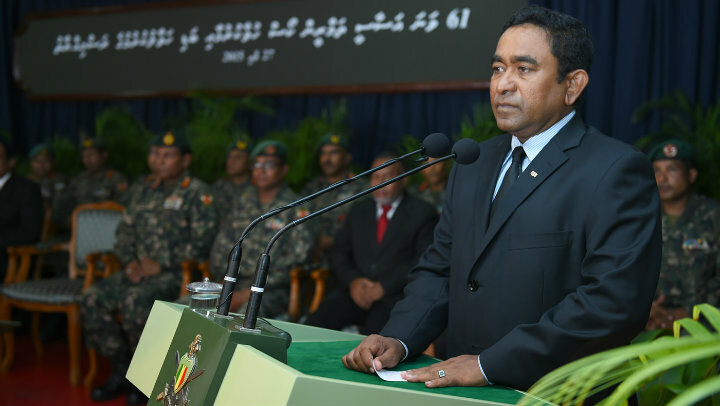 President Yameen said corruption and injustice in the Maldives resulted from the discriminate enforcement of the law. “Critics of my government claim there is corruption within the government. It is not a problem at all. I will not make an exception to anyone in my government. If anyone is involved [in corruption] or if anyone is convicted of a crime, he has to face the law,” he said. The Maldivian Democratic Party (MDP) insists that there is no obstacle for former President Mohamed Nasheed to represent the main opposition party in official talks with the government. The government had rejected Nasheed as the party’s representative on the grounds that the opposition leader is serving a 13-year jail sentence. 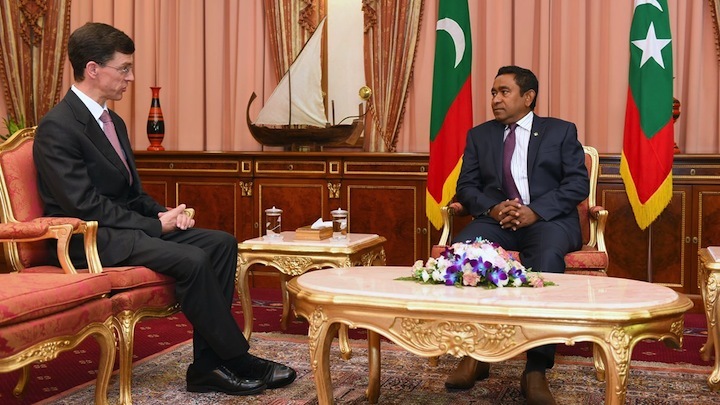 The government had facilitated meetings with meetings with Nasheed for representatives from the UN and the Commonwealth after his conviction in March, the party noted. 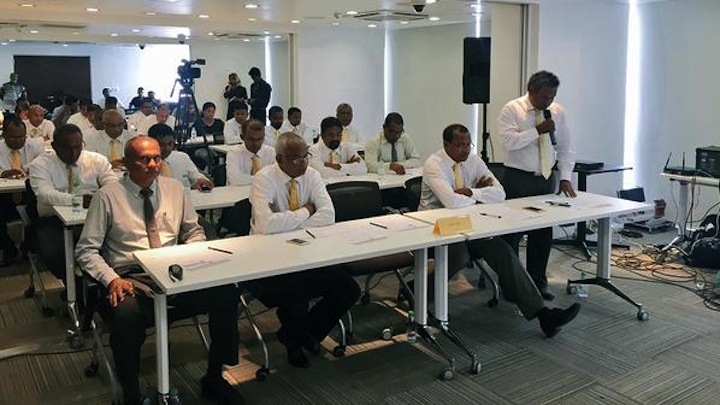 The MDP said that it is essential for all political parties, including the ruling Progressive Party of Maldives (PPM), to sit down together for the talks. 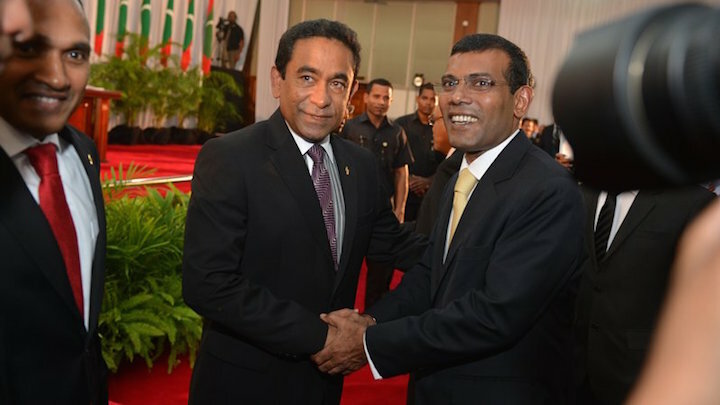 President Yameen had called for separate talks with the three allied opposition parties – the MDP, the Jumhooree Party (JP) and the Adhaalath Party (AP) – to resolve the ongoing political crisis triggered by the arrest and imprisonment of Nasheed and ex-defence minister Mohamed Nazim. The JP promptly accepted the invitation for talks, but the religious conservative AP proposed its detained president, Sheikh Imran Abdulla, among the party’s representatives. Imran was released from police custody yesterday and faces charges of encouraging violence during the May Day mass anti-government demonstration. The May Day demonstration was the second mass protest staged by the opposition calling for Nasheed and Nazim’s immediate release. The government has ruled out negotiations over the release of Nasheed and Nazim, insisting the president does not have the constitutional authority to release convicts before the appeal process is exhausted. President Yameen sent official invitations for the talks two weeks after the May Day protest. The proposed agenda for talks focuses on three aspects: political reconciliation, strengthening the judiciary and legal system and political party participation in economic and social development. “If there is no legal, medical, physical or administrative obstructions regarding the representatives proposed by the three parties, we will proceed with the talks,” president’s office spokesperson Ibrahim Muaz Ali tweeted earlier this week. The human rights watchdog has welcomed the government’s calls for talks with opposition parties to resolve the ongoing political crisis. In a press statement last night, the Human Rights Commission of Maldives (HRCM) urged all political parties to make good use of the opportunity with sincerity and good faith. The commission said peace and stability are essential for protecting and promoting human rights, urging all parties to work together and to refrain from actions and rhetoric that incites hatred and animosity among the public. The HRCM also expressed concern with the assault of police officers as well as complaints of police brutality against opposition protesters. President Abdulla Yameen extended official invitations for separate talks with the three allied opposition parties last week. However, the government has ruled out negotiations over the release of imprisoned former President Mohamed Nasheed and former defence minister Mohamed Nazim, whose arrest triggered the current political crisis. The Maldivian Democratic Party (MDP) has proposed imprisoned former President Mohamed Nasheed, chairperson Ali Waheed and MP Ibrahim “Ibu” Mohamed Solih as representatives for talks with the government. The main opposition party’s national council adopted a resolution today to accept the government’s calls for dialogue to resolve the ongoing political crisis. “The [MDP] believes that the anxiety and distress in the country can be resolved by all the opposition parties sitting down at the table for discussions with the government,” reads the resolution. However, the government has ruled out negotiations over the release Nasheed and former defence minister Mohamed Nazim, insisting the president does not have the constitutional authority to release convicts before the appeal process is exhausted. President’s office spokesperson Ibrahim Muaz was not responding to calls at the time of publication. However, Muaz told Haveeru before the resolution was passed that the government will go ahead with the talks even if the MDP declines the president’s offer. During the national council debate on the resolution, MP Eva Abdulla stressed the importance of talks involving all political parties, including the ruling Progressive Party of Maldives (PPM). “MDP is the first party that called to solve the political crisis. So we are happy the government took the initiative to hold talks and we accept it. But we want to hold the discussions together, not separately as the government has suggested,” she said. President Yameen had sent invitations to the three allied opposition parties separately and assigned two ministerial teams for the talks. Eva also argued that the agenda for the talks should be up for discussion. “We are not going to discussions to talk only about what the government wants. The discussions will include what the government wants, but also what we want. The agenda of the talks also should be set at the discussions,” she said. Nasheed is currently serving a 13-year jail term at the high-security Maafushi prison following his conviction on terrorism charges in March. The MDP has maintained that the trial was a politically motivated attempt to bar the party’s president and presumptive candidate from the 2018 presidential election. Foreign governments and international bodies including the UN have criticized the trial for apparent lack of due process, while the EU parliament has called for Nasheed’s immediate release. MDP chairperson Ali Waheed was meanwhile released from police custody this afternoon. He had been held in remand detention since his arrest in the wake of the mass anti-government demonstration on May 1. Police have concluded an investigation on charges of inciting violence and forwarded a case against Waheed to the prosecutor general’s office. A seven-day extension of detention granted by the criminal court expired today. While the Jumhooree Party (JP) has accepted the invitation for talks, the religious conservative Adhaalath Party proposed its detained president, Sheikh Imran Abdulla, among the party’s representatives. Imran was also arrested on May 1 and remains in police custody. Speaking at today’s emergency meeting of the national council, MP Ibu, MDP parliamentary group leader, noted that the acceptance of the government’s invitation does not mean the party trusts the government. “We are going to sit down with the government not necessarily because we trust them. We should always learn from what has happened in the past. Recently we saw the Ukrainian government sitting down for talks with Russia despite the distrust,” he said. Ibu said the planned mass protest for June 12 – organised by the MDP – is also a call for discussions. “The June 12 protest is also a symbol of negotiations and talks. So I call on the people of Maldives who support our cause to come and join us in discussions,” he said. Other members of the national council questioned the “sincerity” of the government’s invitation for talks. “The deputy leader of JP, Ameen Ibrahim, was set free by the High Court but the state once again appealed his case in the apex court to detain him again. 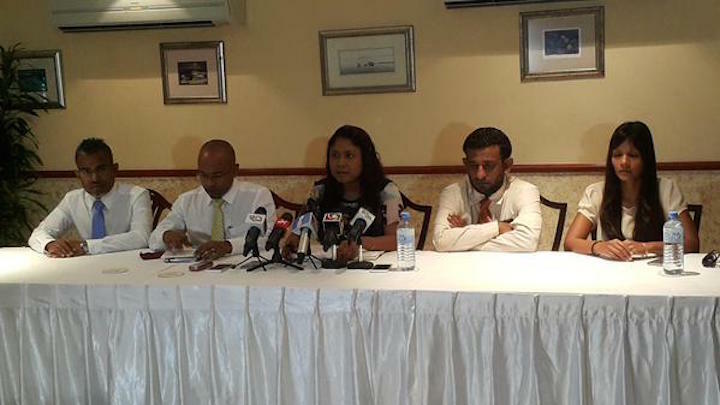 So the intent of the government is questionable,” said MP Rozaina Adam. Ameen is among the five-member team to represent the Jumhooree Party. Some opposition politicians contend the police’s attempt to detain Ameen is an attempt to prevent him from representing the JP. The resolution was passed with the support of of 42 members with one vote against. The dissenting member objected referring to Nasheed as the party’s president, arguing that the government might reject the resolution on the grounds that he no longer holds the post. In late April, the pro-government majority voted through amendments to the Prison and Parole Act that prohibited inmates from holding high-level posts in political parties. The revised law effectively stripped Nasheed of the MDP presidency.